Content marketing? Our specialty! This guide explains how you can kick off a successful content program for your industrial manufacturing firm. Is your industrial manufacturing firm behind the curve when it comes to content marketing? If you’re not really sure about what to do next, you’re certainly not alone in your industry. In a recent study from CMI, only 18% of manufacturers report their content marketing efforts are actually effective! 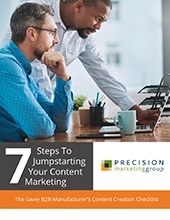 How to lay a solid foundation for your manufacturing content marketing program. Insider tips for executing each of the seven steps. Fresh ideas for the types of content you can produce... and more! Let's make content marketing work for your manufacturing business, shall we? Simply fill out the form to receive a copy of our free guide!